Getting right content to right people at the right time is essential, which should be unique identity of an analytics division & also be able to handle large scale of data via non-traditional analytic techniques and visualizes it in real time. The accuracy, integrity and clarity of solutions through Visualization techniques should be a perfect mix of 6W’s (What, When, Where, Why, How & Who) which plays an integral part while connecting to managers for the daily attention and focus. Story of losing soldiers on a journey towards east & while returning how they lost how many soldiers crossing a river, how much soldiers could not survive in cold. Temperature, date, and man count are interpolated between the distributed data points. Losses are assumed to occur gradually, counts are assumed to represent the number of men at the beginning of a given leg. Additional data-points were added to adjust the timeline to the battles of Maloyaroslavets, Vyazma, and Berezina. 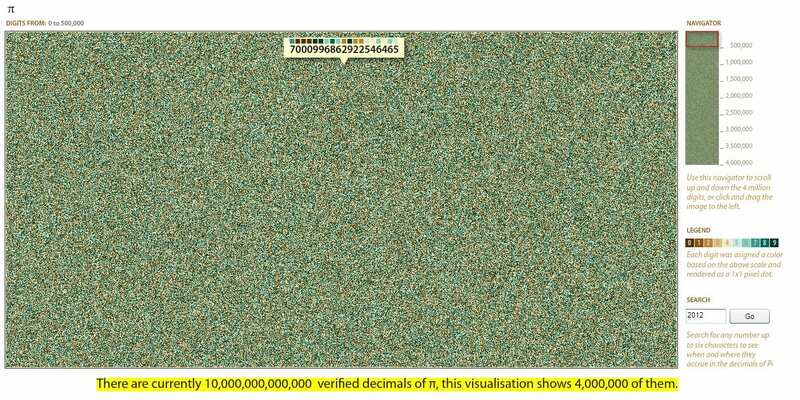 On October 17, 2011, Shigeru Kondo concluded 371 days of computing 10,000,000,000,000 decimal places of Pi, roughly 44 TB disk was needed to perform the computation, and 7.6 TB of disk was needed to store the compressed output of decimal and hexadecimal digits. 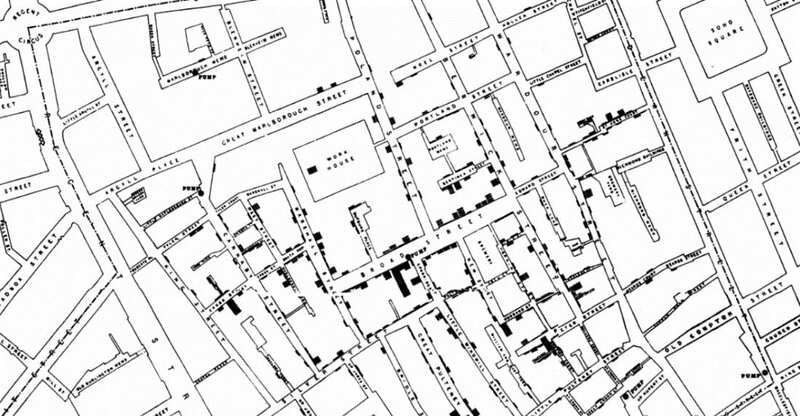 The September 1854 cholera outbreak was centered in the Soho district, close to Snow’s house. Snow mapped the 13 public wells and all the known cholera deaths around Soho, and noted the spatial clustering of cases around one particular water pump on the southwest corner of the intersection of Broad (now Broadwick) Street and Cambridge (now Lexington) Street. He examined water samples from various wells under a microscope, and confirmed the presence of an unknown bacterium in the Broad Street samples. Despite strong skepticism from the local authorities, he had the pump handle removed from the Broad Street pump and the outbreak quickly subsided. Dark points shows the deaths and if carefully observed all deaths were concentrated around a water pump. The earliest form of written communication is visual, & are symbolized as the pictures represent the way of communication. As communication evolved we used to communicate complex ideas through texts, but that has not worked well for numbers. We can easily decode numbers much more easily and quickly by visual form. 30-50% of brain devoted to visual processing. Around 70% of sensory receptors in analyzing. It makes tenth second to make a visual sense, really just at a glance of an eye. 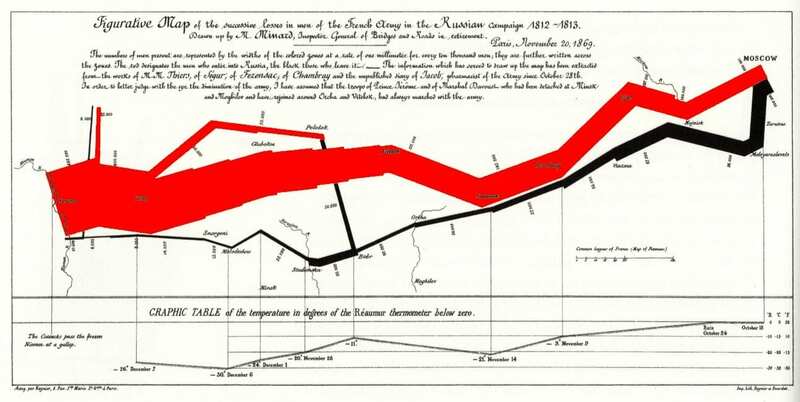 If we have a close look into John Snow and Napoleon’s visualizations we can notice the positive sides of the analog part of storytelling i.e. Visualization is just more than data or charts or maps, at their best they are stories. Humans being telling each other, stories as their primary means of communications from tens and thousand years. These above beautiful concepts and knowledge are referred from Lynda.com. I found it very use full and interesting therefore I summarized above.